I've found THE GREAT LEXICON OF POLISH WEAPONS OF 1939. VOL. 62: OBSERVATION & BARRAGE BALLOONS (http://www.biblio.com/book/great-lexicon-polish-weapons-of1939-vol/d/823858408) for reference so I'll need to use my Polish to English dictionary heavily. If anyone has other recommendations for research material I would be very interested in hearing them! I don't know how the R-35s were painted. All I've found so far are textual references. Both France and Poland were early implementers of multi-colored camouflage schemes, with most examples I've seen pictured being hard camo for France and a transition from hard camo to soft camo on Polish vehicles during the late 1930s. The tans, greens and red browns used by both nations look similar to my untrained eye. In 1938 the Polish Army bought two R35 tanks for testing. After a series of tests it was found that the design was completely unreliable and the Poles decided to buy the French SOMUA S35 tanks instead, a proposal that was later refused by the French government. However, as the threat of war became apparent and the production rate of the new Polish 7TP tank was insufficient, in April 1939 it was decided to buy a hundred R 35 tanks as an emergency measure. 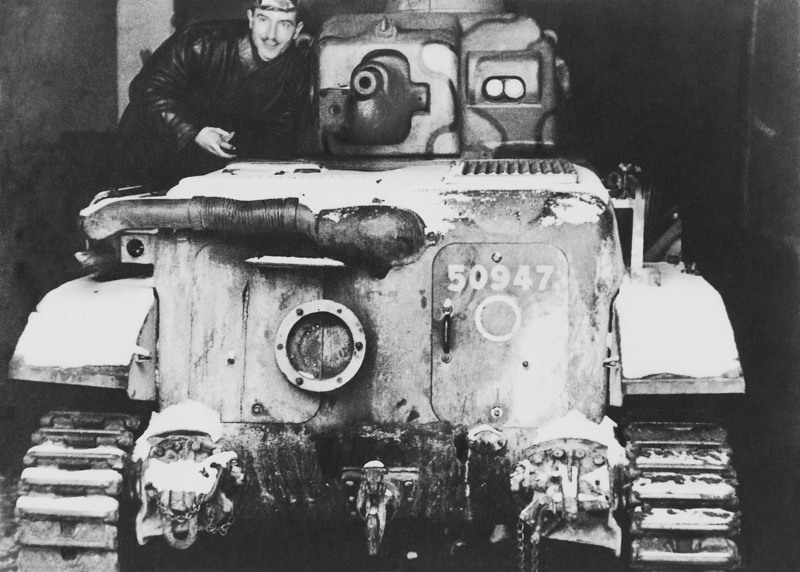 The first fifty (other sources lower the number to 49) arrived in Poland in July 1939, along with three Hotchkiss H35 tanks bought for testing. 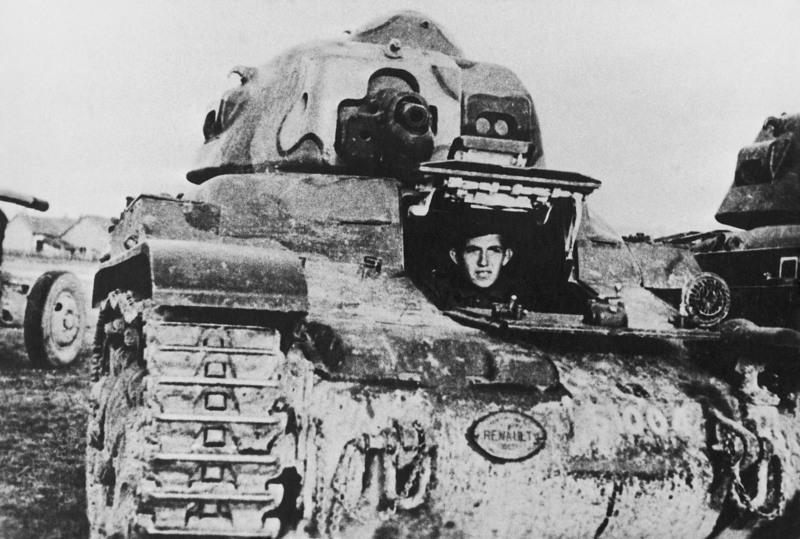 Most were put into service with the Łuck-based 12th Armoured Battalion. 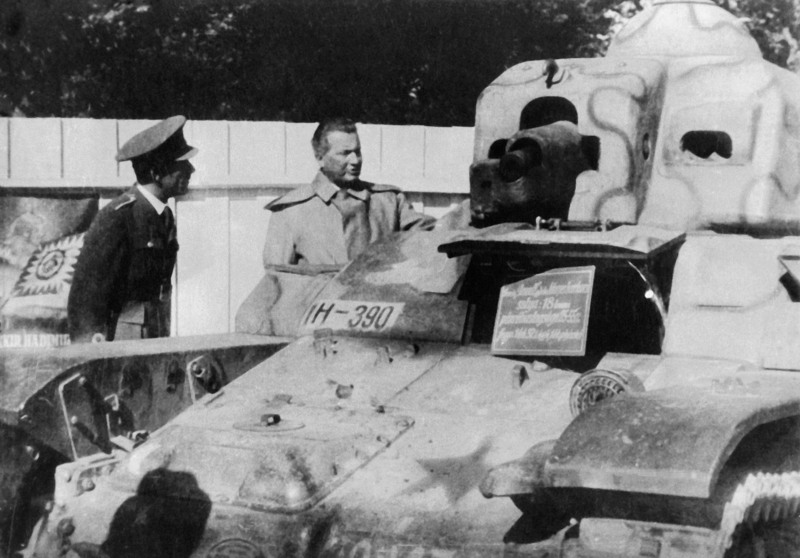 During the Invasion of Poland 45 tanks formed the core of the newly created 21st Light Tank Battalion that was part of the general reserve of the Commander in Chief. The unit was to defend the Romanian Bridgehead, but was divided after the Soviet invasion of Poland of 17 September. 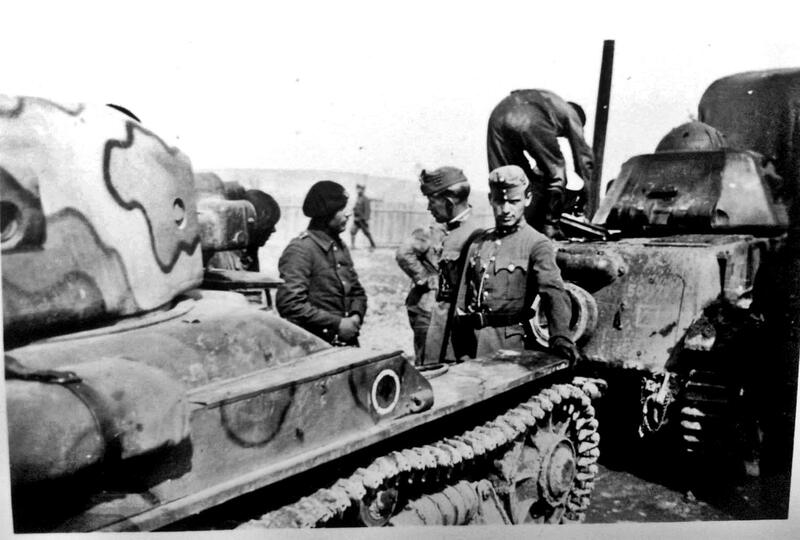 Thirty-four tanks were withdrawn to Romania, while the remaining tanks were pressed into service with the improvised Dubno Operational Group and took part in the battles of Krasne and Kamionka Strumiłowa. Six tanks were also attached to the 10th Motorized Cavalry Brigade. The second shipment of R35 did not reach Poland prior to the outbreak of World War II and was redirected to Syria in October. Thanks for that, it also seems to open up the use of the Hotchkiss light tank as well. The Soviets used T-26s, T-28s, T-35s & the BT fast tanks and probably some others. I also see armored railroad cars being used. Lots of room for modeling subjects here. I think the first one looks stronger in the small size. Ideas? Opinions? I agree, I think the 1st "1939" says it all! My vote goes to #1 as well. Thanks John, we're official! Follow the link above to enlist! Any other ideas for a ribbon? We still have some time to consider other options . . .
What's the best 7TP available now in 1:35 - the Mirage one? - assuming I can find it in the UK. The first ribbon will be better in my opinion. I do not know of any others. There is a PE fret available and a metal barrel. I'm going to try fitting a set of Fruil tracks made for the Soviet T-26 another tank derived from the Vickers 6 ton. Didn't Hobby Boss recently release a Vickers? Possibly that kit might contribute more bits to replace the Mirage parts. I just looked through Squadron's listings for Hobby Boss, Trumpeter , ICM and Takom without finding the Vickers 6 Ton. HB does have a Vickers Medium Tank but it looks to be a very different animal. Sit, I do seem to recall somebody had one out in the recent past . . . Concerning the 7TP kits the Polish company Spojna originally put out kits of the 7TP series tanks. Mirage acquired the molds after they went out of business so there is no difference in the kits that I am aware of. Spojna and Mirage are the only kits 've found so far. I'm happy to see that this campaign will start! I'm in, and my vote is for the first ribbon. Thanks for the heads up! Scalemates lists a new kit from Combat Armour Models but no other info. I'll report back if I find one! Welcome everyone to the Poland 1939 Campaign. We are now official and as of this morning, have the required 10 enlistees so we should be good to go once the December 1st start date rolls around. Fair enough on the 7TP. I have yet to delve into mine but hope to learn from your build. The Panzer 1B sounds like a good build also. Did you have a kit in mind? If you still yearn to build a T-26, consider the Hobby Boss kits. While I haven't built one yet, I do have several different versions somewhere in the heap. They look good in the box . . .
BTW, even though you only get one ribbon awarded at the end, there is nothing to stop you from building more than one kit for our Poland 1939 campaign . . . Please do let us know what you find out. I'll bet many of us would be happy to hear of a better kit. Do you know how they were painted and marked in Polish service? Thanks Marek, those pics will be very helpful in case anyone has a notion to build an R-35 in Polish service. I know Hobby Boss makes a kit and Fruil makes tracks so this should be an attractive build.